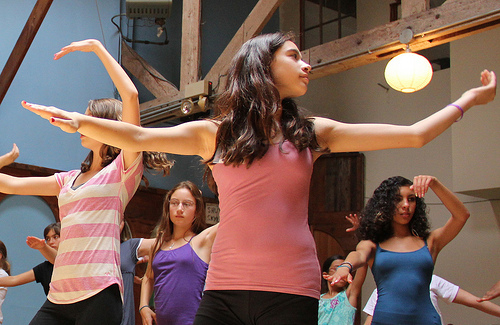 A program of Afsaneh Arts & Culture Society, Danceversity promotes a positive experience of different cultures for youth (ages 7-17) through an innovative curriculum of multicultural dance and music. The programs encourage and celebrate diversity and artistic expression and serve to build cross-cultural competency, self-esteem, leadership skills and physical education opportunities. We provide a variety of weekly classes throughout the school year as well as hosting a 2-3 week summer camp in August. Kalaripayattu South Indian Martial Arts with Kamala Devam for youth (ages 7-17). This is an exciting martial art form from the southern Indian state of Kerala called 'Kalaripayattu'. This martial art is thought to be the mother of all others, incorporating the fighting actions of animals found in India and moving in graceful, circular motions between fantastic kicks and flying jumps. Students will become stronger, more flexible and have fun learning a new way of moving. No previous martial arts or dance experience is needed.